For my edit, I adjusted the levels, warmed it up a little and added kim klassen's broken book texture at 75% opacity. 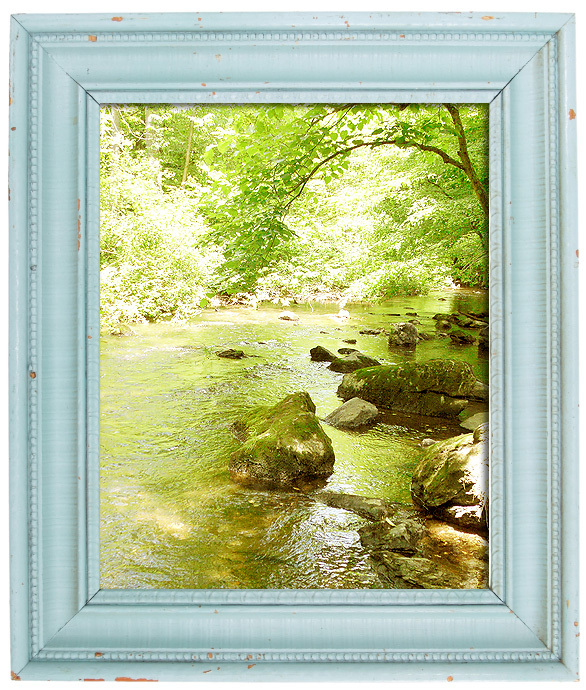 I then added the antique blue frame image that I found on istock photo. I added the inner shadow on the photo using photoshop fx layer styles. Well will try this and if you have a better way for me to do this, let me know. Meanwhile WHAT A FUN PROJECT!!! AND here is my edit. Tried to imagine myself in the late afternoon down be the river at my cabin, during the "golden hour"
You brightened it up beautifully! I love your edit! it was beautiful to begin with, so i'd have been totally intimidated by it. but you did wonders! That is stunning! Love the frame! Oh my, what an edit! Deb, you need to teach me how to do the frames again. Beautiful edit. I love how much you brightened it. The colors really pop now. Great job. So I did an attempt at editing this photo which was really fun. Have along way to go on learning my editing, but here is my attempt on my blog. Wonderful job Deb. Really great edit. So pretty, and the frame is very unique. I love it! What a beautiful edit! The blue frame is very creative. It was a great photo to begin with and I think even better in the 2nd! I just want to sit and soak my feet. :) Love the frame edit. Love the crop and the colors in this one! Gorgeous!